Salt affects most species of plant and fish on a cellular level as they lack epidermal layers capable of protecting them from contact hazards. A process known as osmosis is normally what the cells of plants and fish rely on to equalize the intake and output of nutrients and wastes. In the case where cells are introduced to saltwater, the cell tries to equalize the amount of salt inside and outside by taking in as much salt as possible. However, the cell often bursts before this is achieved. As such, just as with fish, only plants whose cells have adapted to environments with high quantities of salt can survive in saltwater or the ocean. There are 110 species in the Rhizophora genus, of which 54 might be considered true mangroves. They all occur in coastal regions of tropical and subtropical climates, forming what is known as a mangrove swamp with their extensive intermeshed root systems and pneumatophores or “knees” which keep the mangrove trunks and leaves above the high tide marker. 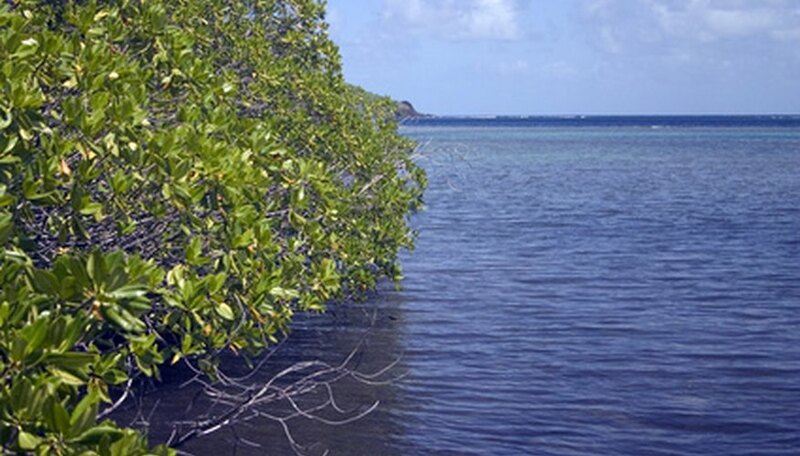 In this way, mangroves can survive in both freshwater and saltwater environments. Mangrove swamps create ecosystems for many species found nowhere else on the planet as well as prevent the slow erosion of coastal landmasses. Mangroves can grow up to 80 feet high, but most mature at 20 feet. They have thick gray-brown bark with smooth, elliptical leaves, ranging from 3 to 5 inches long. Most notably, aside from the root system, are the propagules, fully-formed, self-contained miniature mangrove trees that grow to the size of a thumb before dropping off and taking root away from the parent tree. Phytoplankton are single-celled bacteria and algae which make up the largest and most diverse plant grouping on the planet. Each is too small for the naked eye to see and they reproduce by cell division. There are so many phytoplankton in the ocean that, working together, they produce two-thirds of all new oxygen on the planet during photosynthesis. They make up the lowest group in the food chain, without which there could be no ocean life. Genera include diatoms, which have a calcium-based protective shell that generations upon generations of build-up create diatomaceous earth, which is used in abrasives. Flagellates have whip-like tails that they use to propel themselves through the water. Kelp is a group of large-scale multicellular brown algae that inhabits cool ocean waters in depths ranging from 6 to 90 feet. While kelp inhabits most of the ocean, it is predominantly found along the coastlines of the Pacific Ocean in what are called kelp forests, creating an undersea ecosystem for invertebrates, fish, marine mammals and birds. Giant kelp (Macrocystis pyrifera) and bull kelp (Nereocystis luetkeana) are those species commonly found in kelp forests. Both mature at 100 feet in length, forming around a cylindrical buoyant gass bladder from which long streamers extend to catch sunlight for photosynthesis. Bull kelp can grow up to 10 inches a day while giant kelp can grow up to two feet per day. While bull kelp has longer streamers or blades, giant kelp has specially designed bladders along its length in which its spores are contained for reproductive purposes.